No environment on Earth imposes greater physical and biological constraints on life than the deep oceanic midwaters. Near-freezing temperatures, the absence of sunlight, enormous pressure, and a low food supply make habitation by any living thing almost inconceivable. Yet 160 species of anglerfishes are found there in surprising profusion. Monstrous in appearance, anglerfishes possess a host of unique and spectacular morphological, behavioral, and physiological innovations. 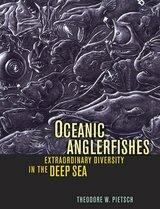 In this fully illustrated book, the first to focus on these intriguing fish, Theodore W. Pietsch delivers a comprehensive summary of all that is known about anglerfishes—morphology, diversity, evolution, geographic distribution, bioluminescence, and reproduction. Theodore W. Pietsch is Dorothy T. Gilbert Professor in the College of Ocean and Fishery Sciences, and Curator of Fishes at the Burke Museum of Natural History and Culture, University of Washington.